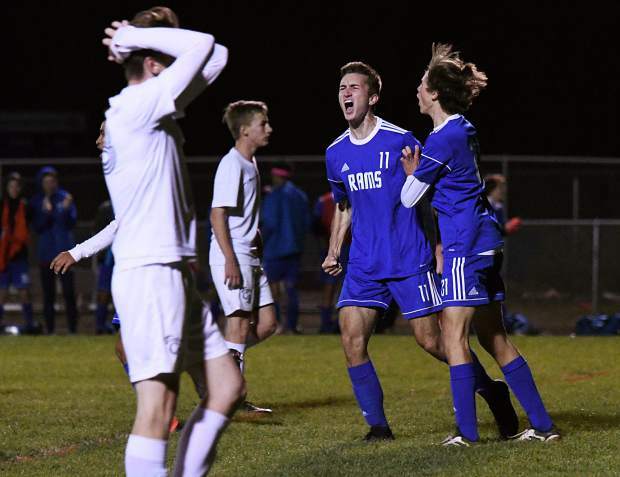 Roaring Fork Rams celebrate after Aiden Sloan's goal in the first half against the Coal Ridge Titans on Thursday evening. The Coal Ridge Titan goalie catches the ball in the box during Thursday night's game against the Roaring Fork Rams. Roaring Fork Ram Joe Sallnas fights against two Coal Ridge Titans to win possession of the ball during Thursday night's game at Roaring Fork High School. Roaring Fork Ram Aiden Sloan and Coal Ridge Titan Jack Price fight for possession of the ball during Thursday night's game at Roaring Fork High School. Aidan Sloan had a Senior Night he’ll never forget. 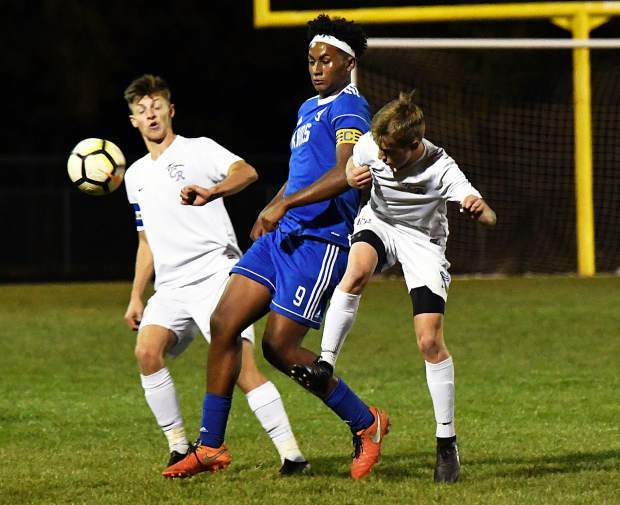 Sloan headed home a cross from sophomore Alvin Garcia with 1 minutes, 9 seconds remaining in Thursday’s clash with the Coal Ridge Titans at Carbondale Middle School, lifting the Rams over the Titans 2-1, giving Roaring Fork the 3A Western Slope League championship. Coming into the game, the Rams needed to beat the Titans and have the Basalt Longhorns lose to the Delta Panthers on the road. 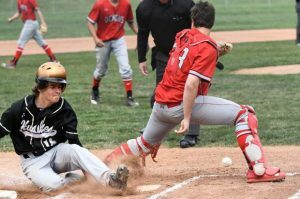 Delta took care of the Longhorns 4-1, meaning Roaring Fork needed to win or tie and it would be league champs. 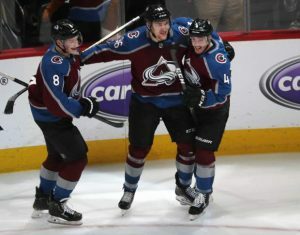 Sloan’s goal with just over a minute left made sure the Rams left no doubt as to which team was the best in the league for the 2018 season. 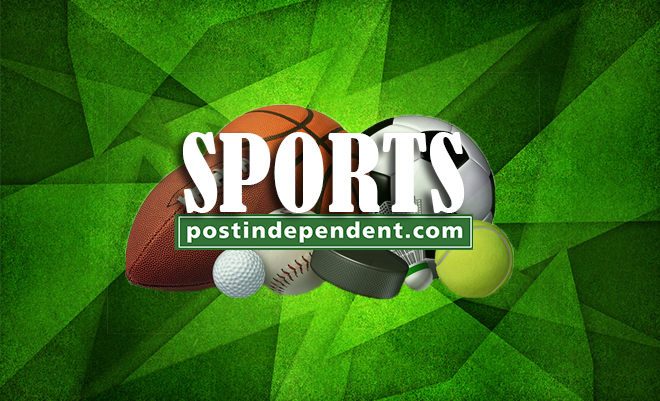 Roaring Fork put itself in the must-win position due to a slip-up against Basalt on Sept. 25, a 3-2 loss in double overtime that saw the Rams miss a penalty kick in the first overtime before Basalt cashed in during the second overtime for the win. Prior to the start of the game, the Rams knew Delta held a 1-0 lead early in the game, but once the game kicked off between the Rams and Titans, the Roaring Fork players were unaware of the score elsewhere. Both teams came out locked in a defensive battle near midfield with few chances either way. 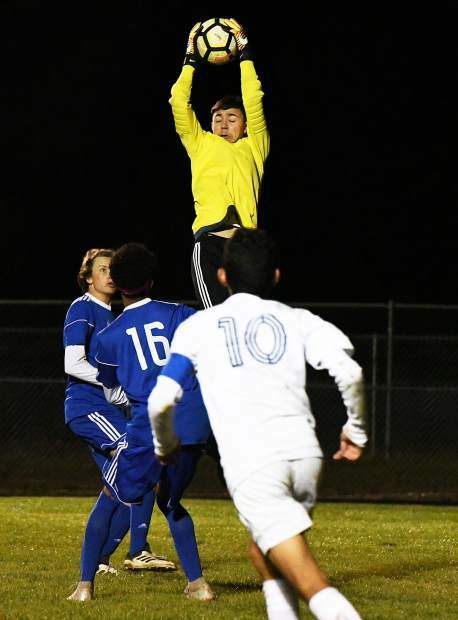 However, when chances came about, they were high-quality chances, as Roaring Fork senior Ronald Clemente received a cross from Sloan in the box near the left post, but Coal Ridge sophomore goalkeeper Cody Connor came up with a great save, keeping the Rams off the board early. 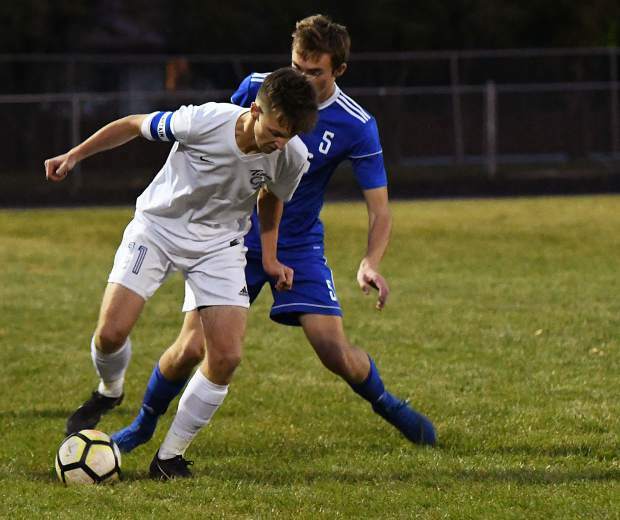 Coal Ridge responded with two strong chances in the first half as well, as senior Kade Frees broke free behind the Roaring Fork defense for a shot on goal that Roaring Fork senior Leo Loya kicked aside. Minutes later, Frees tracked down a loose ball behind the Roaring Fork back line, reaching the ball just before Loya challenged. Frees’ chip shot skipped right of the far post, keeping the game knotted at 0-0 despite some prime chances. A free kick from Coal Ridge’s Denilsson Espinoza skimmed over the crossbar midway through the first half before Sloan capitalized at the other end for the Rams, opening the scoring with a second-chance goal on the back post. With 8:06 left in the first half, a cross from Roaring Fork junior Dylan Webster found Sloan on the back post, where the senior tried to redirect the cross into the net. A diving Connor made an the initial save on a spectacular effort play, but Sloan got his foot on the ball again off the rebound, muscling the ball home for the opening goal, sending the Rams into the half with a 1-0 lead over the Titans. Coming out of the break, Coal Ridge started to control play after the lengthy break to celebrate Senior Night for the Rams. Senior Gustavo Archila drew a penalty in the box on a Roaring Fork defender, setting up Espinoza for the penalty kick 10 minutes, 15 seconds in to the second half. Espinoza calmly slotted the penalty kick inside the right post, knotting the game up at 1-1, putting pressure on the Rams’ title hopes. 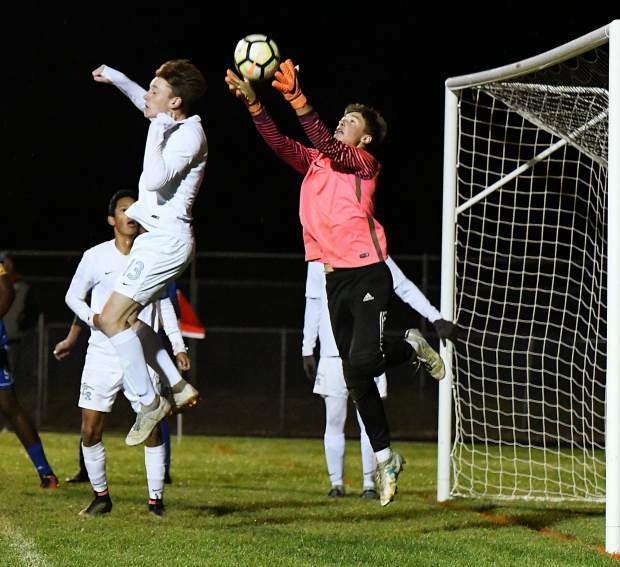 The Rams responded as Sloan broke free on a clear run at Connor, but the sophomore goalkeeper came out to challenge and smothered the ball inside the box, ending Sloan’s scoring chance quickly. Minutes later, Roaring Fork sophomore Gustavo Amador saw his free kick deflect off the top of the crossbar, as the Rams narrowly missed going on top with 16:33 left in the game. Coal Ridge nearly took a 2-1 lead with 13 minutes to go in the game as junior Ivan Gallardo tracked down a deflected ball and slipped a shot under a diving Loya from about 10 yards off the goal line. Gallardo’s shot was slowed by Loya just enough, allowing Webster to track back quickly, clearing the ball off the goal line, keeping the game tied at 1-1. Building off of the second chance Webster generated with his defensive play, the Rams took the late lead as senior Joe Salinas, a force in the middle of the field all game long, found Garcia on the left wing. The sophomore corralled the pass and quickly crossed into an open Sloan, who rose up and headed home the ball, giving the Rams a late 2-1 lead. Coal Ridge nearly tied the game late as Loya had trouble handling a shot. A follow-up shot from the Titans after Loya bobbled the ball bounced off the far left post before the Rams cleared the ball away, sealing the 2-1 win, giving Roaring Fork the 3A WSL championship. Following the win, Forbes praised his kids for accomplishing a goal they set at the beginning of the season, but Forbes said he still feels there’s another level to Roaring Fork’s game that they haven’t quite reached yet. 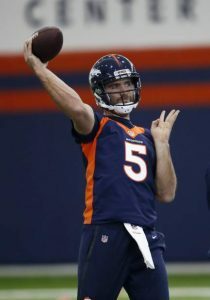 The Rams and Titans now await Sunday’s 3A Colorado High School Activities Association playoff bracket release, which will come out Sunday morning. Both programs will likely host a first round playoff game next week.